Here they come, the Patty Girls! With their Patagonia puffy jackets and their "Pat Rubberlegs" stonefly meal for some hungry trout! They search out every river and stream, even the ones that are a bit high and murky from the Wyoming runoff this year. What will they find??? 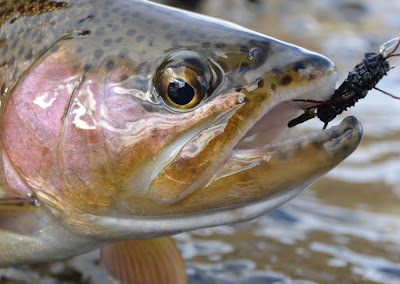 Trout with appetites for an imitation of a stonefly that guide, Pat Bennett of Hyde Outfitters in Island Park, ID. created. Similar to the girdle bug, this tasty treat is very popular out here in the West. 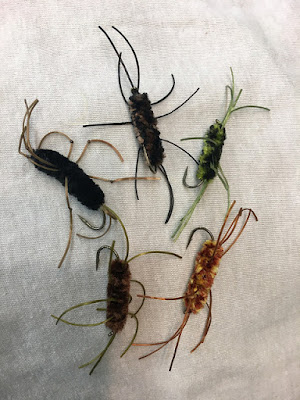 As easy as the pattern looks, it can be frustrating to tie because the rubber legs can be hard to handle while you are placing them. But, after a few, you learn a few tricks to make it easier. 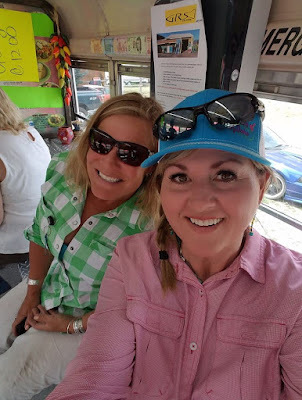 So, my friend Clairey and I set out for a few days to explore the beautiful country surrounding Jackson Hole, Wyoming. What trip could have more beautiful mountains to look at, right? Oh, how I love the Grand Tetons and there majestic presence. The highest peak reaches to over 13,000 feet. The Grand Teton Natl. Park is neighbors with Yellowstone Natl. Park. So, there is not a shortage of breathtaking views! My video will tell the rest. Many hours of driving back country roads and laughing all the way. My "sassy mama on the fly" is a great friend and hostess that has a huge heart. She also rowed me down one of her home waters and cooked up some great grub. And she knows the way to an awesome taco bus!!! Great pics! Girdle bugs great in NC this time of year as well. I miss green landscapes a little... Thanks for taking me there! Thanks for the taking me along Emily. Alan... It sure is! One place that you just don't get tired of! Thanks for stopping by! Back in Chapter one of my life I had the pleasure of spending some time around Jackson. It was strange back then with a lot of strange people. But the fishing looked good and the company even better. Keep on Em! Howard - The only thing that's strange now is the parking lot of Utah license plates in Jackson. Haha... Dang tourists! I don't know about my blogroll. This post just popped up this morning (3 days late). Was that you I saw in the story about girls fly fishing in Montana? Mark - A little blog trickery I'm afraid! Haha. I started writing in July and wanted a July date. Haha. So, I backdated. Sorry... Mt and Wy were fished in July. I need to slow down someday! Bill - I have been to Cody twice to fish. Yes... It is wonderful water! Love the Big Horn especially. Pat's Rubberlegs is such an absurd looking fly, but I'll be darned if it doesn't work about as well or better than any stonefly nymph imitation! 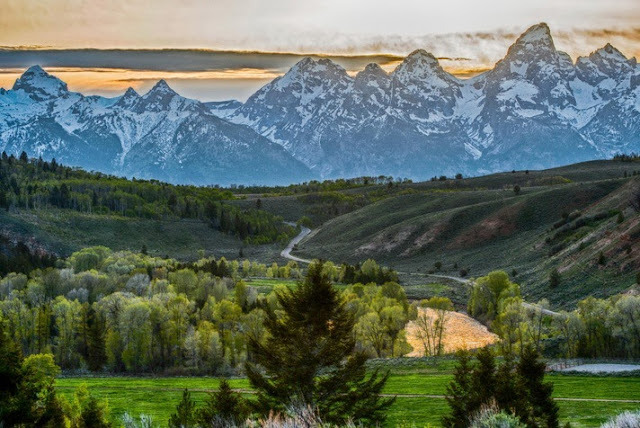 Gorgeous photo of the Tetons. Thanks for stopping by, RM. That Pat reminds me of a tootsie roll with legs. But, if that's what they like, that's what they get! Everybody needs a friend who knows where the taco trucks are at. Fun video, thanks for sharing your latest adventure.